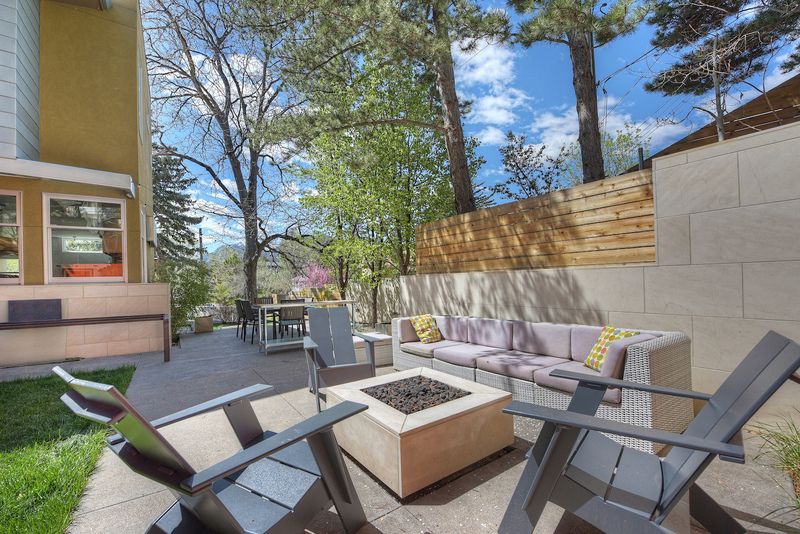 2325 Panorama is centered in the heart of Boulder’s historic Whittier neighborhood. First established in 1872 by entrepreneurs and thought leaders who sought to profit from 14­-year­-old Boulder’s population boom, Whittier’s well­-heeled settlers were instrumental in establishing the university, attracting “high ­tech” railroad and telegraph investment, and creating The Pine Street, now Whittier International Elementary. Today, Whittier continues to be one of Boulder’s A+ neighborhoods, unceasingly attracting influencers who embrace its gracious mature trees and historic tenor, married with the convenience of living 6 blocks from Whole Foods/Google, 5 blocks from Pearl Street, 5 blocks from sought­ after Whittier Elementary, and minutes away from the freeway to Denver. Cradled by Alpine Hill to the north and the unfolding city to the south, this urban home is nestled within vibrant gardens and outdoor living rooms, a house folded amid conscientiously conserved mature trees. Envisioned as a space for exuberance and a source of serenity, this co­-creative design between renown Boulder architect George Watt and the owner/designer resulted in a superbly ­executed 2010 home rooted to the land through modern, warm, durable building materials that marry the outdoor living spaces with its richly detailed interior. The results were celebrated in Summer 2012 Luxe Magazine. Embodying the environmental sensibilities of sustainable living, this hyper­ green home integrates building systems such as geothermal heating and cooling, a super insulated building envelope, high performance windows and doors, and solar ­ready plumbing. It uses a fraction of the energy of a conventionally built home. This oasis in the city is a rare combination of energy performance, comfort, sense of place, and beauty. Please see the impressive details in our Green Home & Tech Notes. A cascade of stairs invites you up from the street. Through the front gate, you’ll notice distinctive architectural lines and angles, interwoven with the warmth of honed buffalo limestone tile, wood, and steel exterior elements. Lush landscaping welcomes you with mature shade trees, bamboo grasses, abundant perennials, terraced bench seating, steel trellises and a front patio with a Flatirons view. At the front door, limestone exterior walls flow seamlessly into the interior. The home reveals itself as a balance of flowing, contemporary spaces. Organized around a spectacular sculptural staircase of walnut, glass, and steel bathed in natural light, the rooms are unified by solid black walnut floors, harvested from the owner’s family farm in the Ozarks. Enormous skylights and ample well-­placed windows allow light to pour in, while providing maximum privacy, leaving you feeling snug and at home. The spacious kitchen anchors the main floor. Stand at the oversized Vetrazzo recycled glass island and see your whole front and back yards, as well as adjoining living and dining rooms. Huge windows overlooking the backyard entertaining spaces double as pass­through serving windows, connecting kitchen to backyard. The kitchen gathers community, fitted for inspired cooking, with a 48­ inch Wolf Dual­Fuel stove with 4 high­output gas burners and a 24­inch griddle, double fan Vent­A­Hood, and 48” Sub Zero, and Miele dishwasher. Glass tile walls and backsplash, yards of stainless steel countertops, stainless steel toe­kicks, LZF Italian bent wood chandelier, and a pantry with 3M panels layer special detail upon special detail. The kitchen flows seamlessly into the adjacent living room. Floor­-to­-ceiling south­facing windows provide an airy and spacious backdrop to the inviting seating area. The focal point is the open modern honed buffalo limestone and concrete gas fireplace. Steps away, the dining room (with art lighting and drum chandeliers) can seat a sizeable (20+!) merry dinner party. Adjacent to the dining room is an office, with secret fireman’s pole down to the lower level, a riot to use when your merry dinner party takes the evening up a notch. Next to the office and across from the kitchen, the thoughtful custom mud room has cubbies, hooks, and cabinets for the whole family. It hosts the home’s command center, with desk, bulletin board, and drawers for crafts and hobbies. You’ll also find a built­in dog gate and butler’s pantry. Adjoining powder room showcases playful fused glass custom decorative tiles, designer wallpaper, Ceasarstone counter and porcelain floor. Finally, tucked away at the north of the home, the family room offers you the opportunity to nestle in tranquility, removed from the energy of the main floor connected spaces. From the main floor, thick walnut steps lead you up the sun­-drenched, architecturally-impressive open-­riser staircase. At the second floor landing, take a quick right into the comfortable master bedroom, whose sitting area has built­in walnut shelves. The sumptuous master bathroom invites you to lounge in an extra deep tub or to unwind in the steam shower with ipe bench. As in a high ­end spa, your senses will be soothed with marvelous material choices, including natural limestone fossil tile, Robern anti­-fogging medicine cabinets, Ceasarstone counters, and diffused LED lighting. Walk­-in closet includes built­in dressers with soft-­close Blum hinges. The south-­facing private master deck with stainless steel cable railings encourages owners to relax and breathe while enjoying our mighty Flatirons. The upper floor has two additional bedrooms, both a quick left from the top of the stairs. The southern bedroom also has outstanding southern views and two closets; the northern bedroom has a backyard view and built­in daybed with storage drawers underneath. Shared bathroom is equipped with Ceasarstone counters, Hansgrohe fixtures, glass tile backsplash and porcelain floors. Steps away, the laundry room is another example of the home’s excellent planning, plumbed for two sets of washers and dryers. The private second story library office has an 11.5 ft ceiling, an inviting gas fireplace with limestone surround, and grasscloth on the walls. From the main floor, we can either take the stairs or the firepole down to the garden level. Turn right at the bottom of the stairs to enjoy the rec room, with built­in bookcase, rope swing, tons of closets, solid pocket doors, and a cork floor. The spacious guest room gets natural light from a large egress window well. Garden level ¾ bath is bright and bold with orange tiles, a river rock shower floor, and glass shelving. Turn left at the bottom of the stairs and you will find another mudroom, super convenient to the garage just beyond, with storage and hooks. Fireman’s pole here can be easily converted into a closet, should sliding not be part of your lifestyle. The tandem two­-car garage, light-filled from the frosted glass garage door, has epoxy floors, plenty of storage, electric car charging capability, and a sump pump. Garage closet was built to accommodate a future dumbwaiter into upstairs butler’s pantry. Sump pump failure alarm is tied to the ADT alarm system. An automatic exhaust fan expels car exhaust. To the north of the garage is a storage room with utility sink and a passively-­cooled wine storage room. Ready to get outside? Retire in the evening to your private outdoor room and garden, surrounded by towering Austrian pines, pin oak, dwarf honey crisp apple, Japanese maple, birch, and Cleveland pear trees. Lean back in your Adirondack chair, feet up around the gas fire pit, listen to the serene stainless water feature trickling amid night noises, and enjoy your view of the Flatirons. To the east, grass and a wooden play fort discretely welcome youthful play. Beyond the satisfying life at this fully­-loaded home, the Whittier neighborhood offers you the ultimate Boulder lifestyle. Walk under mature trees on quiet streets to Boxcar & Cured for coffee or Spanish ham. Enjoy biking miles of hidden city bike trails or pedal over to the Rayback Collective for yoga and a food truck dinner. Climb at some of the nation’s top climbing gyms, minutes away. E­town, The Dairy Arts Center, Boulder Theater and CU provide thought-­provoking cultural offerings. Buy local at our farmer’s market. Many private and public schools & preschools are within walking/biking distance, including Mapleton Early Childhood Center, Whittier Elementary (the longest operating school in CO), Casey Middle, Boulder High and Watershed School. And our city’s entrepreneurial and business power houses are a stone’s throw away. Whatever your lifestyle is, this home and location will provide you with a playful and restful sophisticated urban nest.